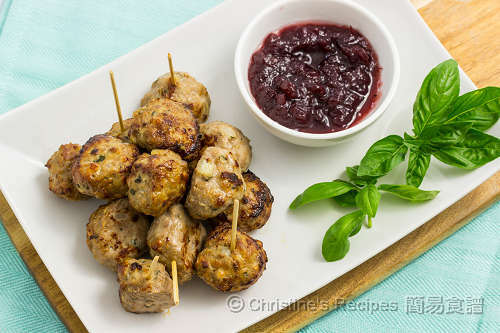 These little meatballs are perfect as finger food in Christmas party. 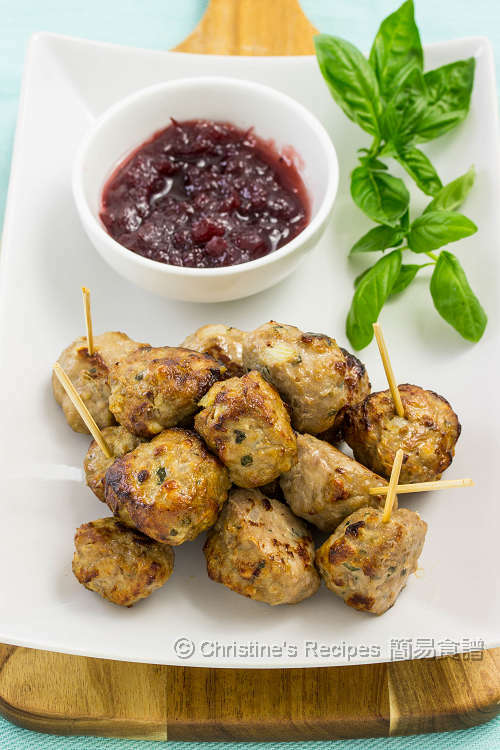 The tooth picks will help keep your hands clean from dipping the little meatballs into the delicious cranberry sauce. Your guests will appreciate your thoughtful arrangements. 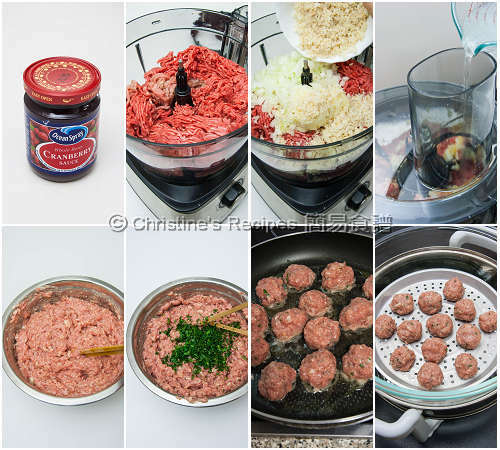 You might notice there are two ingredients in the recipe, not often used to make meatballs. Yes, they are soda water and mashed potato. These two special ingredients can magically keep the meatballs even moist and soft than usual ones. 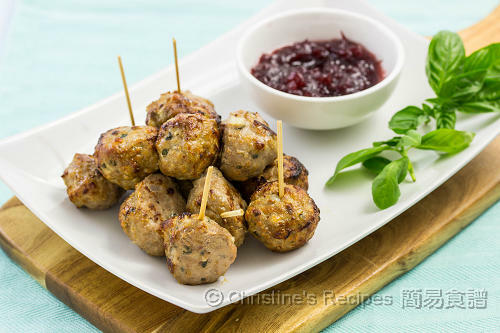 The cranberry sauce I used was store-bought, so it’s very handy to prepare this party snack. Even better, these meatballs can be made well ahead without any fuss. Let’s enjoy the party ! Use a food processor to mix beef, pork, onion, breadcrumbs, mashed potato, eggs and salt together. While processing, gradually add soda water. Process about 2 minutes until smooth. Mix in the chopped basil and parsley. (Remark: if not using food process, your hands are good tools. Place all ingredients in a deep and large mixing bowl. Use your hands to squeeze and mix them thoroughly. Make sure your hands are clean though.) Refrigerate for 30 minutes. Use wet hands to shape teaspoons of mince mixture into balls. Heat oil and butter in a large frying pan over medium high heat until butter is foaming. Pan fry meatballs, shaking pan occasionally or turning them with a spatula, for about 8 to 10 minutes, or until cooked through. (Remark: Or you might like to bake the meatballs in a convection oven, at 200C / 390F for about 10 minutes. Turn to another side and bake 8 to 10 minutes more. Remember to spray some oil on surfaces before baking and don’t over bake them. Otherwise, the meatballs will turn dry.) Serve warm with cranberry sauce. I divided the mince mixture into two batches, one pan-fried and the other baked. The results I found: The baked meatballs in convection oven retained round in shape. The pan-fried ones were cooked in shorter time as a result that they didn’t easily turn dry. Either way is convenient and good. Thanks for recipe. Looks good. What is soda water, Pl. Soda water is carbonated water, often used to make cocktail drinks or mix with fruit juice. Meatballs are my husband's top favourite! These look extremely tasty with cranberry sauce. Wow! Fantastic Christmas recipe. "I utilize a slow cooker for this recipe. I fill a 4 quart simmering pot brimming with solidified meatballs and twofold the sauce recipe and cook on high for around 4 hours. Heavenly! Everybody at our home cherishes the adjusted rendition of Christmas Meatballs." Happy Holidays! hi Christine, whats the purpose of the eggs in the meatballs? thank you. They help increase flavour and moist. hi Christine, can I skip the soda water and mashed potatoes? You can skip them if you don't have any in hand. The texture of your meatballs will be different from mine. These two things help create tender texture. Hi Christine, thanks for the recipe it already look nice. I want to make this for my toddler, I intend to skip the soda water. If so, should I replace it with plain water? Yes, you can replace with water. Adjust the amount to get the right consistency you want.